So by the end of last year reviews of this book were all over Goodreads and book blogs, but even seeing the interesting synopsis for the book and the excitement in reader’s reviews, I just wasn’t sure about the book. I’m not a huge contemporary romance reader, and tend to stick to fantasy. The first book I’ve ever tried along a similar genre was ‘The Fault in Our Stars’, and while it wasn’t as amazing as everyone had led me to believe, it was nice. A little too sappy for my tastes maybe, but nice. This book was along the same lines. 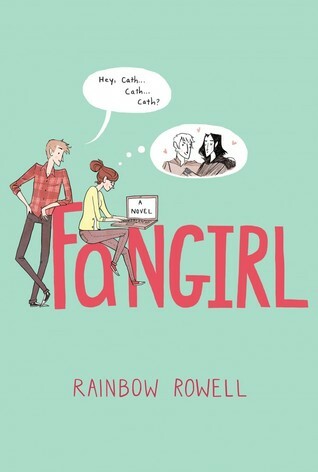 ‘Fangirl’ isn’t the type of book I’d read over and over again – or read in one sitting – but I’m glad I gave into my base urge to check the book out from the library because “it was so pretty!”, since the story within the pages is one of a kind. The book started out strong and for the first two-thirds of the book I just couldn’t stop reading. Up until there, this novel wasn’t big on boy troubles and focused more on Cath’s family problems, her obsession with Simon & Baz – two wizards reminiscent of Harry Potter characters – and her quirks. And of course there was Levi. In the beginning we’re led to think that he’s Reagan’s boyfriend, and while I’m not denying that he is, from the very first time we met him I knew he was going to play a major part in Cath’s life. I loved how unlike male characters in other books, he wasn’t perfect. He had a receding hairline, an old pickup truck, and was getting a degree in agriculture. Plus, if you had any protein bars, he’d steal them. Making up for his “flaws” was his ever-present smile. He was the opposite of Cath in every way, and that’s part of what I think makes readers love him so much. And just when I felt like things were getting too mushy, the author brought in new problems and pushed Levi to the side for a while. The pacing in this book is great! ‘Fangirl’ is an amusing coming-of-age novel with unexpectedly unreal characters who made this book next to perfect. I’d recommend it for fans of ‘The Fault in Our Stars’ and ‘Eleanor & Park’. ← To Have A Blogging Buddy, or Not To Have?